Their shows are always worth going to! If it says anything, I drove over 600 miles and 10+ hours JUST to see them. 11/10! 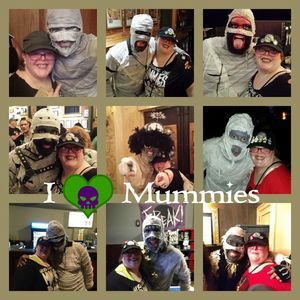 Seriously, Here Come the Mummies puts on the best live shows. I love going, and the next day I'm already counting down the days to the next show. Mummies killed it, as expected. Sun Studio was awesome, perfect opening act for those funky wrapped up men. The Clyde was gorgeous, the sound was perfection, the venue huge. Would certainly go see the boys there again. Absolutely amazing show...they never disappoint!! !just wished they had a meet and greet after the show but totally understand that they didn't. A-m-a-z-i-n-g!!!!! This was our 6th time seeing HCTM and these fellas are so talented and fun! We enjoyed this concert better than any we have seen thus far! They looked like they were having fun, as well!! !